What do you think the above god looks like? You will find many interesting non-conventional gods and goddesses in Taoist temples across Asia. The above photo is taken from a temple in Taiwan. 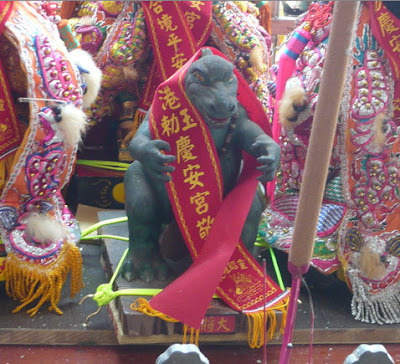 On the first look, I thought the Godzila has taken a vacation from the entertainment world and came to Taiwan to be worshiped as god. Well, I am not arguing since the name 'Godzila' starts with 'God', then it is only logical that Godzila is worshiped as a god... Only some Chinese has this acute instinct than others!